The Schrödinger equation is the basic equation in quantum mechanics describing the change over time of the state vector l ψ > of an arbitrary quantum system. It is equivalent to an eigenvalue problem in the theory of Hilbert spaces as shown by John von Neumann. Its physical interpretation is generally taken within the Copenhagen interpretation of quantum mechanics. The Schrödinger equation was established in primitive form in 1926 by Erwin Schrödinger and was generalised by Paul Dirac a few years later. It initially adopted the ideas of the mathematicians Hamilton and Félix Klein to extend De Broglie's theory of matter-waves. 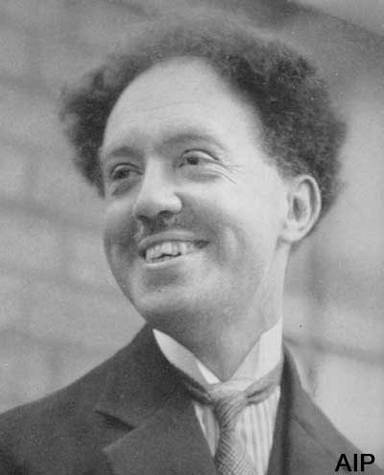 Louis De Broglie (Credit: AIP). 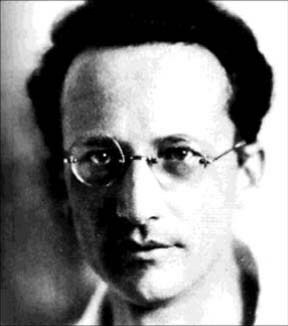 Thus Schrödinger discovered a partial derivative equation describing a Hamiltonian mechanical system using a field scalar ψ propagating coordinates of this system in 6N dimensional space When applied to a particle in a field, it is akin to a wave equation in space and time, hence the name wave mechanics sometimes used for this particular and special form of quantum mechanics. This also explains why the state vector l ψ > is sometimes called a wave function ψ (x) of the system. As its discoverer realised, it shows that the quantification of the energy of atomic systems results from formulation in terms of the Sturm Liouville problem, or the problem of eigenvalues for a linear differential operator H. Initially, it was not in relativistic form for particles, and it was Dirac again who found a generalisation for this. This equation introduced complex numbers at a fundamental level to describe the state of a quantum system, and its solutions are probability amplitudes that the system when measured will be in a given state, proton or neutron, spin up or down etc. To each possible process in the space of the states of the system, and in its phase space in the sense of analytical mechanics, there corresponds an amplitude of probabilities that the process will take place. These probability amplitudes interfere and their squares give the probability of observing the system with a precise value of its dynamic variables: energy, spin, momentum etc. This is actually just the application of Huygens' principle for a scalar wave to the scalar of the Schrödinger field in the phase space. The Schrödinger equation governs all processes on a microscopic scale, and therefore the physics of molecules down to quarks, it should also cosmology, when the universe was the size of an elementary particle. One of the most important properties of this equation in quantum mechanics is that it leads to the phenomenon of quantum entanglement. The Schrödinger equation for a system of nuclei and their electrons. (Credit: Robert Laughlin). An alternative and very powerful formulation of the Schrödinger equation was given by Richard Feynman using his famous path integral. 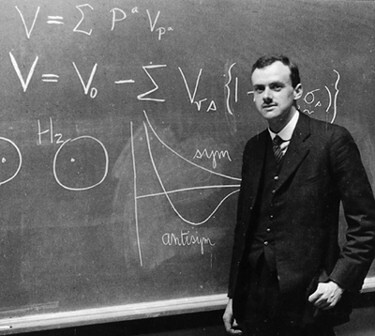 The Feynman formulation is not as general as the Dirac form for a state vector in Hilbert space, but it is the more flexible and practical when Yang-Mills fields and quantum cosmology are developed from quantum theory. String theory is largely based on this formulation. 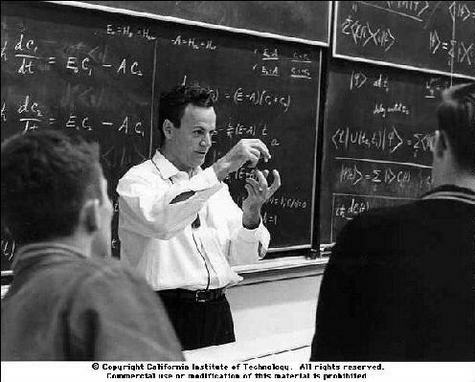 Richard Feynman, explaining the theory of the ammonia maser to students at Caltech. 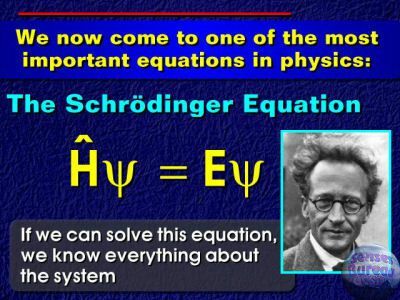 The Schrödinger equation is linear, and there is speculation on modifying it by adding non-linear terms in order to solve enigmas posed by quantum mechanics, such as the emergence of the classical state from the quantum state. The thought experiment known as "Schrödinger's cat" is one example among others of this. It concerns the theory of measurement and decoherence.